Your complete guide to the new characters, amazing tech, wild speculation and more! Ah, welcome my friend! Come on in from the barren, frozen wasteland of Hoth dear visitor. Yes, we see that glint in your eye, that yearning to consume every last drop of Star Wars: The Force Awakens information. No, no, don't offer any explanation or excuse. It's fine, we understand - it's Star Wars, right? Well, you're safe now, your toils are over, as below we have everything we know about the new film pooled into one super handy, spoiler-free guide. We've got the hottest images, the sweetest trailers and all the essential knowledge about new locations, characters and technology, among much, much more. So pour yourself a Ruby Bliel, put your feet up on a Jawa and blast off into Star Wars: The Force Awakens heaven. For the next couple of weeks on T3.com, we're T3-PO, the rebel alliance. We'll be looking at the light side of tech, looking at what's good and great about technology in the Star Wars universe and beyond. On the other hand, our sister site techradar has become the evil techvadar. Read more about T3-PO vs techvadar and check out the dark side of tech on techvadar, too! Check out these luxury Star Wars pens! Description: One of the film's new villains, Kylo Ren is apparently not a Sith Lord but instead a Knight of Ren and is in the service of Supreme Leader Snoke, the yet-to-be-seen big bad. Ren also utilizes a self-built lightsaber with a distinctive crossguard (see the 'New Technology' section for more info), that according to the film's director, J.J. Abrams, 'is as dangerous and as fierce and as ragged' as Ren himself. From what we've seen so far, Ren wears a distinctive metal face mask, as well as an a-typical black hooded robe ensemble that just screams bad guy. From the latest trailer, we also know that Ren seems to go up against a blue lightsaber wielding Finn on the film's new ice world, however why he is there and for what purpose remains a mystery. Description: We know little about Rey, however what we do know is intriguing. A female scavenger operating on the new desert planet of Jakku, Rey owns a landspeeder, a custom-made quarterstaff and dresses in ragged tan clothes. In the latest trailer we see her scavenging in the ruined skeleton of a Star Destroyer that has crash-landed on Jakku, as well as travelling with Finn, BB-8 Droid and - that's right! - Han Solo. While we see her engaged in some contextless action in the trailer, what really intrigues with Rey is her lack of any last name or apparent background. Is she Luke's daughter? What about Han and Leia's? Or is she someone else entirely? And why is she living such a rough, isolated life on Jakku? If the girl is supposed to be Rey, does this mean she is also Force-sensitive and becomes a Jedi in the new film? UPDATE: In the new International Trailer Rey says that she has been 'waiting for her family' on Jakku, whoever that is. Description: Captain Phasma is the leader of the First Order's (see 'Other New Stuff' section for more information) legions of stormtroopers. She wears distinctive metal armour that is reminiscent of a Medieval knight and appears to be armed with a custom blaster rifle. Whether Phasma is all out bad or not we don't yet know, however considering her position in the First Order, here at T3.com we're guessing she's more Boba Fett than Lando Calrissian. Description: We have seen more of a character arc with Finn than many of the other characters, with the film's lead male protagonist appearing at first as a stormtrooper in the army of the First Order. However, over the trailers released, it's obvious that Finn leaves that life behind, joining up seemingly with Rey and then later Han Solo. We've seen shots of Finn meeting Poe Dameron at a Resistance base, exploring new locations with Rey and BB-8 and, most likely, on-board the Millennium Falcon. At some point in Star Wars: The Force Awakens, Finn also seems to get his hands on Anakin's old blue lightsaber, although whether or not he becomes a Jedi is unknown. Description: General in the army of the First Order and commander of Starkiller Base (nice nod there to Luke Skywalker's original name in the first Star Wars script, 'Luke Starkiller') Hux appears to be another villain from what we've seen and read so far. I think it's pretty safe to assume that Hux is evil, like Grand Moff Tarkin evil, but who knows? Description: An ace fighter pilot in the new film's Resistance, Poe Dameron appears to get quite a bit of screen time in Star Wars: The Force Awakens. We've seen him piloting a black, custom,T-70 X-Wing in multiple locations. We've seen him being taken into custody by the First Order and then tortured by Kylo Ren. And, we've seen him give Finn that knowing look on the Resistance base. Is he the new Wedge Antilles? Or will he have a larger, less flight-heavy role in the new series of films? Description: We have not seen this big bad yet in any promotional imagery or trailers, however we do know that Kylo Ren serves under Supreme Leader Snoke, and that he is being played by motion capture master Andy Serkis. Does this mean Snoke will be another CG creation? Almost certainly, although hopefully he won't look anything like our other, franchise-killing CG chum, Jar Jar Binks. Description: A desert planet littered with the remains of the Battle of Jakku, an epic conflict that occurred following the event of Star Wars: The Return of the Jedi, Jakku is home to scavengers, violent gangs and one of the new film's protagonists, Rey. It is also the planet that Finn crashes on near the start of the film in a heavily damaged TIE fighter. In the latest trailer we also got to see the Millennium Falcon soaring in and around its ruinous surface, while being chased by what appear to be forces of the First Order. We're pretty sure that it is on Jakku that Finn, Rey and Han Solo are brought together, but how and why remains a mystery. Description: We've seen what we presume to be a single ice world briefly in multiple of the released trailers, with Kylo Ren shown striding into a frozen forest, X-Wings and TIE fighters dogfighting over its mountainous and craggy surface, and Finn wielding Anakin's old lightsaber on it. Rumours have suggested that Kylo Ren is a bit of Darth Vader fanboy and is desirous of his old lightsaber - so could he be searching for it here? We know Finn ends up with it at some point, but he doesn't have it at the start of the film, so someone else does. Who could that person be? Maybe the yet-to-be-seen Luke Skywalker. Well, either him or Jar Jar. Description: Another unknown planet from the trailers is this lush, forest world. The Resistance definitely have a base there, as can be seen in the nearby image, and there also seems to be a pretty epic battle during the film. Simply due to a visual similarity, we've made a guess that this could be Yavin 4, the jungle moon that orbits around the gas giant of Yavin. It could, of course, be somewhere completely new, however regardless of whether it is new or old, it definitely seems to be controlled by the Resistance. Description: The Internet believes this image shows the entrance to Maz Kanata's castle stronghold. If true, that means Finn, Rey and Han are on Takodana, an outlaw world filled with pirates, bandits and misfits. Kanata, who is played by Lupita Nyong'o via motion capture, is queen of this stronghold, housing travelers and smugglers within its thick walls. What Han and company are doing here though remains unclear. Description: Kylo Ren's crossguard lightsaber made quite the impact when unveiled in the first teaser trailer for Star Wars: The Force Awakens, with its unique fire-like main blade and twin smaller crossguard blades offering something totally new. According to what has been released, Ren built this lightsaber himself, and it supposedly reflects how fierce and dangerous he is. Here at T3.com we like how the saber is remiscent of Medieval great swords, which seems an apt choice considering the Kylo is a Knight of Ren. If it is more powerful or not than the classic lightsaber is up for conjecture. Description: The classic starfighter is back in Star Wars: The Force Awakens, however apparently with a newer, more advanced model. Poe Dameron, who has a custom black X-Wing, leads an elite unit of next generation T-70 X-Wing pilots. Each T-70 is equipped with four Ion engines and four laser cannons, with room for a single pilot and Astro droid on board. These babies seem to get a lot of action in the film from what we've seen, with a series of spectacular dogfights already released in the film's numerous trailers. Description: The cheeky ball-tastic BB-8 is a spherical astromech droid that is loyal to Resistance starfighter ace Poe Dameron. Indeed, we've seen images of BB-8 mounted within a T-70 X-Wing's droid socket, so we're guessing it's Poe's. That said, the trailers also show BB-8 rolling around the desert planet of Jakku, as well as Takodana among other locals, so be prepared for plenty of hot droid action in the film. For those who need more BB-8 right now, then check out 'The Merch' section of this guide for details on the recently released toy version. Description: Again, thanks to some industrious digging on the behalf of the Internet, we are now pretty confident that this futuristic looking new version of the Star Destroyer is called the 'Finalizer'. That is, however, pretty much all we know about the Finalizer, with any advanced capabilities remaining under lock and key. Thanks to the latest trailer however, we did get a shot of its bridge, with Kylo Ren delivering his 'I will finish what you started' speech while looking out from it into some classic J.J. Abrams lens flare. Description: Ok, so this tech doesn't look super advanced, but it is still new and an update to the classic landspeeder from the original trilogy. We've seen Rey ride the speeder on Jakku, where it has most likely been her vehicle of choice when out on scavenging missions. Description: In what essentially seems to be the Empire mark II, the First Order is the new, stormtrooper-tastic evil organisation of Star Wars: The Force Awakens. Lead by the film's big bad, Supreme Leader Snoke, the First Order operate out of Starkiller Base, which supposedly sports a superweapon capable of destroying entire star systems. Interestingly, while there definitely seems to be members of its organisation that are Force-sensitive, such as Kylo Ren, they don't seem to be hand-in-glove with the Sith. We're guessing that the First Order will be a constant threat throughout the upcoming trilogy. Description: In our eyes here at T3.com, the Knights of Ren are one of the most interesting new additions to the Star Wars universe. Kylo Ren, the crossguard lightsaber-wielding bad from the trailers, is apparently a member of this organisation (he may lead it), and according to reports anyone who joins their ranks must take the 'Ren' title. This is interesting, as in the previous films, the title 'Darth' seemed to be the title of choice among the Sith. Are the Knights of Ren going to be the new Sith Lords? Is Supreme Leader Snoke a Sith, a Knight or neither? And why were the Knights founded in the first place? All these are questions that remain to be answered. Description: Everyone's favourite rogue is back, although this time looking quite a bit older and wiser. It seem's Han has quite a bit to do in Star Wars: The Force Awakens, being seen in a variety of environments and situations. It looks like Han is going to act as some sort of guide to our two new protagonists Rey and Finn, as we've seen them travelling together on Takodana and what looks like the Falcon. Description: We've seen very, very little of Leia during the promotional run for the film, however we did see her and Han together briefly in the latest trailer. They look upset, which we are guessing is because they are about to seperate. What they've been up to over the past 30 years, as well as if they ever had any children, remains a mystery. UPDATE: J.J. Abrams has revealed that Leia is not referred to as 'Princess' in the film, but rather as 'General'. According to the director, one character does let slip her title from the first triology however. Make of that what you will! Description: It's Chewie and he's back. He'll roar, fire his bowcaster and generally look fabulous. Description: Only images of C-3PO so far, however he's definitely back and looking nice and shiny. No details about what C-3PO has been doing for 30 years have emerged up till now, however if T3.com were to hazzard a guess, then it would be as some sort of shoe-shining, music hall-reject, probability predicting valet to Leia. UPDATE: The new International Trailer (see 'The Trailers' section) has some brief footage of C-3PO at what looks like a Resistance base. Description: Again, very little shown of R2-D2 in the trailers so far, however we did get that money shot of R2-D2 and a hooded figure with a robotic hand (see 'Known Unknowns' section below). Description: Ok, so that's an old shot, we know, we know. However, mysteriously, up to this point the hero of the original trilogy has been completely absent from all promotional material. Luke's not even on the official poster for the film. He is definitely in it though, but where and doing what we have no concrete information on. UPDATE: A new International Trailer has dropped with more juicy footage. UPDATE: A new TV spot has landed with a little new, unseen footage in it. UPDATE: A second International Trailer has landed with even more new, unseen footage. UPDATE: A bunch of new character posters have dropped. Check them out below. UPDATE: A new IMAX poster has been released. UPDATE: A new selection of retro posters have been released. What is unknown: Basically everything. Is this Luke reaching out to R2 in the image above? Where is Luke? Has Luke turned to the dark side? Does Luke have anything to do with Anakin's missing lightsaber? Is Luke still a powerful Jedi? Will Luke survive the film, or will he be bumped off? All this and more remains unknown. What is unknown: Who has inherited the lightsaber and how? Who is this giving and receiving the lightsaber in the image above? Why is Finn seen with the lightsaber at the end of the most recent trailer? Does Kylo Ren want to recover the lightsaber and, if so, for what purpose? What is unknown: Is Finn Force-sensitive? Does Finn become a Jedi? Does he defeat Kylo Ren in the fight shown in the image above? Or, is Finn just a courier for the lightsaber and uses it here out of desperation? What is unknown: Who is Rey? Is she Han and Leia's daughter, or Luke's? Or, is her missing last name simply a red herring? What is unknown: Who is the fallen figure that Rey is crying over? Han Solo? Luke Skywalker? Poe Dameron? Jar Jar Binks? What is unknown: Who has had possession of the Falcon over the last 30 years? Han says, 'Chewie... we're home' in the second trailer, so have they lost possession of the Falcon and had to reclaim it? In addition, does anyone else inherit the Falcon if Han dies? Description: This orange-sized toy is buckets of fun, allowing you to pilot BB-8 around your home through use of a smartphone or tablet app. Description: One of the many, many new Lego Star Wars: The Force Awakens products to be released. This medium sized set is pretty cool though, measuring in at 28x22x20 centimetres and coming with a variety of figures, you can get your evil on in style with Kylo Ren's Command Shuttle. Description: Now you, I mean your children, can pretend to be Kylo Ren with this replica version of the crossguard lightsaber. It lights up, hums audibly, and makes clashing sounds when struck against something. Description: Hunt out the Resistance with this toy Blaster rifle. It fires up to 20 metres and comes with 12 Nerf darts. Description: Errrrm... it's a mug. A mug with Kylo Ren on. Description: This version of Monopoly comes with a Star Wars themed board and characters, however it operates in basically the same way as the original. Roads and utilities are replaced with planets and bases. Star Wars: The Force Awakens is released in cinemas on December 17, 2015. Warning! What follows is speculation, however it is based on numerous Internet leaks and, if you want to walk into Star Wars: The Force Awakens with a fresh mind, then stop reading now. Remember: once seen, they can't be unseen! Warning! WARNING! - POSSIBLE SPOILERS WILL BEGIN BELOW THIS IMAGE OF FIRST ORDER STORMTROOPERS - WARNING! Rey is not the daughter of Han and Leia. Kylo Ren will kill a member of the original cast. General Hux is Luke Skywalker's son. Luke Skywalker has become more powerful than Yoda. Supreme Leader Snoke is actually Jar Jar Binks. 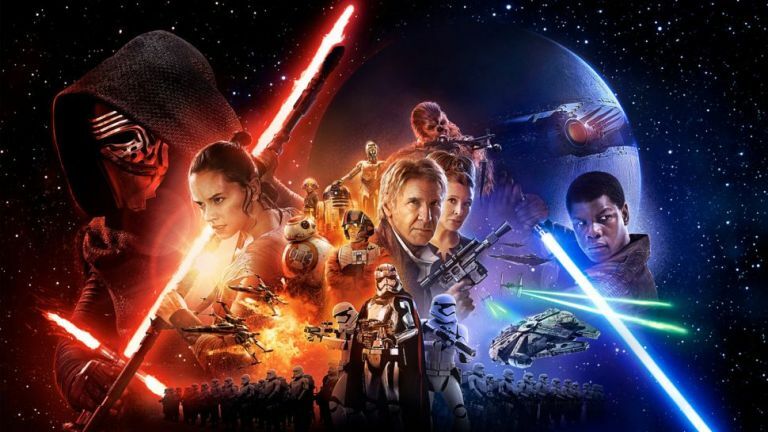 This guide will be periodically added to and updated right up until the release of Star Wars: The Force Awakens. Be sure to check back in the future for even more information.